In an interesting coincidence, while we were talking about the aesthetics of sleep last class, I was about to put the theory into practice. I was about to fall asleep. I wasn’t bored or anything, just, you know, sleepy. I’m also sleepy while writing this. I’m even in bed. If I were talking instead of typing, you’d hear me yawning. But moving on. Two notes. The seventh/eighth-grade ELA state tests are tomorrow. As far as I know, before big tests, “Get a good night’s sleep” homework assignments are pretty normal. I’ve definitely gotten them. 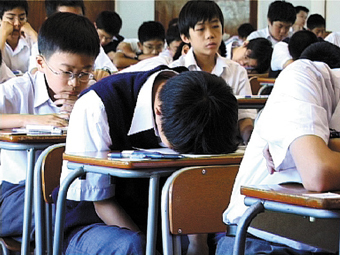 It’s a weird way sleep mixes into education. 2. To paraphrase the great philosopher Moffett, it’s easier to stay alert teaching than studenting. And yet, the cult of coffee-drinking is a huge thing for teachers, but meaningless to students. Coffee is pretty much fetishized (imbued with magical power), such that the idea of coffee and its aura dwarfs “real” coffee and its use-value. Yes, there is a physiological effect of drinking coffee. Caffeine is a drug, after all. But I would argue that the true effect of coffee is its mythical effect, brought on by the fetishized version of coffee. The need is real because of the social perception that the need is real. Even I, a non-coffee-drinker, was acculturated when I started student-teaching. I started buying a cup of coffee in the morning because I knew that was how coffee functioned on the social/cultural level. Or, I knew how it was supposed to function, which ensured that it functioned that way. The real thing followed the model of that thing. To put it like a deconstructionist, the real coffee has been killed and resurrected as a simulation. And now, the simulation of the effect of coffee—coffee’s power as it has been defined by society, coffee in the cultural database—precedes any “real” effect of drinking the thing. I was never a coffee drinker either, until last year. Now, it is a thing to do, socially. Just so happens I read two things on coffee addiction this week… Apparently, Balzac drank tons of it (maybe 40 cups a day) and might have died from it http://www.openculture.com/2013/09/honore-de-balzac-on-the-pleasures-and-pains-of-coffee.html. He even wrote an essay about it (see previous link).